There are many places of interest in Warwickshire, the County being a mixture of agriculture as well as light industrial development. There is rolling countryside and stunning views from the hilltops, and gently rising landscape to the Cotswold Hills and villages to the south west. Warwick , the County Town is proud of its Castle which is one of the finest existing specimens of the 14th Century. 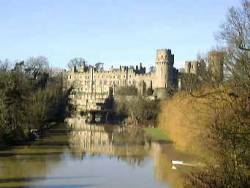 It was the seat of the Earl of Warwick who was heavily involved in the Wars of the Roses (1455 to 1485), and the town also suffered destructive onslaught by the Saxons and the Normans. Warwickshire also boasts some attractive rivers including the Avon, Stour and Tame which flow gracefully throughout the County. Stratford on Avon is also a major tourist attraction and is dominated by its history of William Shakespeare. His birthplace is in the town's main street. Anne Hathaways cottage is a short distance away, and was her family home until she married William. 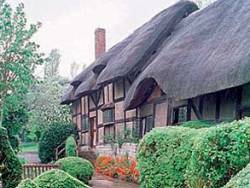 His Mother's house is a little way out of the town, and is known as Mary Arden House. They are all well worth a visit. There are many places of interest of visit including The Royal Shakespeare Theatre and its adjoining museum, The Butterfly Farm and also the River Avon with its pleasure boats and its swans.